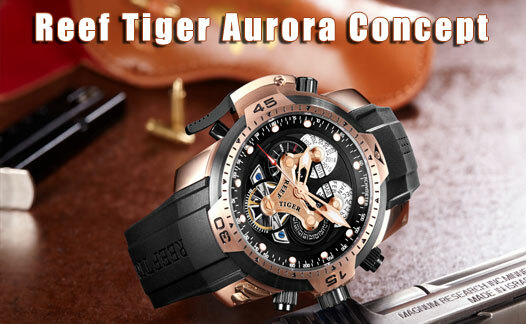 The case of Reef Tiger Aurora Concept watch is used pure imported 316L stainless steel. And the part linked to the crown and the chronograph buttons are adopted the brushed stainless steel. 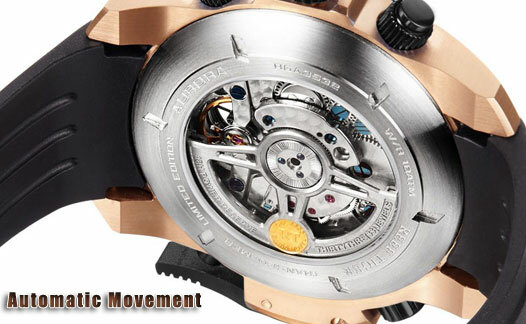 The curved button on the left is in accordance with the overall style design of the watch. Personality and fashion is distinct. Reef Tiger Concept wristwatch uses super luminous heteromorphy as the time scale. Four polygonal time scales on the dial show the fashion from its subtleties. Aurora concept watch use skeleton splicing design; its basic color is light black and it is filled with super luminous. 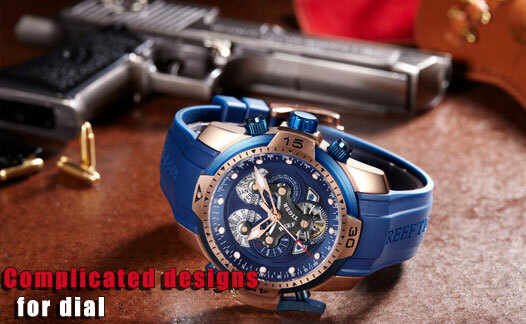 The joint part is used high saturated red, yellow, blue, etc, which corresponds with the color of minute countdown sub-dial, is distinctive characters.